For other uses, see Bohai (disambiguation). 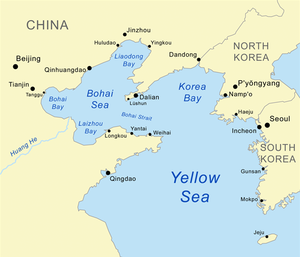 As is the case of most of the Bohai Sea, the Bohai Bay is rich in hydrocarbon deposits and has several active offshore oil fields. Jidong Nanpu contains 7,500,000,000 barrels (1.19×109 m3), while the bay as a whole is estimated to contain 146 billion barrels (23.2×10^9 m3). This page was last edited on 5 January 2019, at 07:35 (UTC).